China has had a particularly long and terrible history of flooding. In the last 2000 years, the Yangtze River has flooded more than 1000 times. But it is the Hwang Ho or "Yellow River" that has been responsible for China's most catastrophic floods. Three thousand miles long, it begins high above sea level in the northern mountain province of Qinghai and ends at the Yellow Sea. Westerners have dubbed it "China's Sorrow," because over the centuries it has killed more people than any other river in the world. In 1887 flooding killed nearly two million people, in 1931 the death toll was almost four million, and in 1938 it was almost one million. 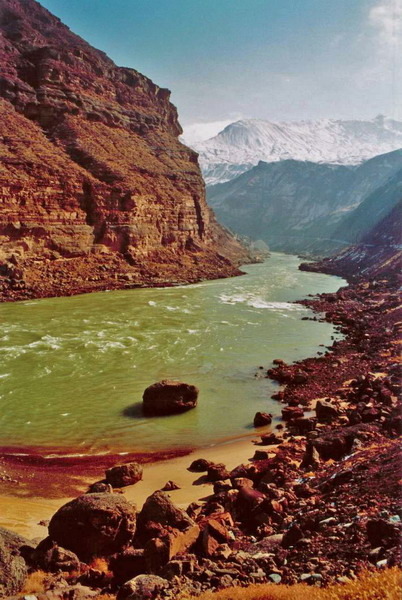 The 1887 Yellow River flood was a devastating flood on the Yellow River (Huang He) in China. This river is prone to flooding due to the elevated nature of the river, running between dykes above the broad plains surrounding it. The flood that began in September 1887 devastated the area, killing some 900,000 people. It was one of the deadliest natural disasters ever recorded. For centuries, the farmers living near the Yellow River had built dikes to contain the rising waters, caused by silt accumulation on the riverbed. In 1887, this rising riverbed, coupled with days of heavy rain, overcame the dikes on around 28th September, causing a massive flood. Since there is no international unit with which to measure a flood's strength it is usually classified by the extent of the damage done,depth of water left and number of casualties. The waters of the Yellow River are generally thought to have broken through the dikes in Huayankou, near the city of Zhengzhou in Henan province. Owing to the low-lying plains near the area, the flood spread very quickly throughout Northern China, covering an estimated 50,000 square miles, swamping agricultural settlements and commercial centers. After the flood, two million were left homeless.The resulting pandemic and lack of basic essentials claimed as many lives as those lost directly by the flood itself. It was one of the worst floods in history, though the later 1931 Yellow River flood may have killed as many as four million.